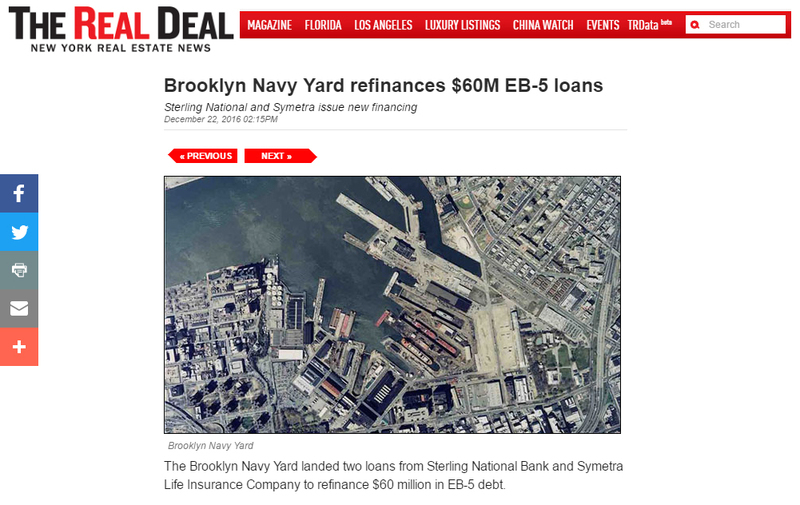 The Brooklyn Navy Yard landed two loans from Sterling National Bank and Symetra Life Insurance Company to refinance $60 million in EB-5 debt. The $30.75 million loan from Sterling carries a 15-year term, and the $31.68 million Symetra loan has a 21.5-year term. The two loans replace EB-5 debt the Navy Yard took out in 2009 – the first of three EB-5 loans taken out by the Yard through the New York City Regional Center. The Singer & Bassuk Organization brokered the loan. “These loans demonstrate the financial health of the Brooklyn Navy Yard and place the Yard on strong financial footing as we undergo our largest expansion in 50 years,” David Ehrenberg, head of the Brooklyn Navy Yard Development Corporation, said in a statement. The Corporation manages the city-owned industrial hub, which is home to 300 firms and 7,000 employees.